IN THE PHOTO: Since the Florida Department of Agriculture and Consumer Services assumed responsibility of the state’s School Nutrition Program three years ago, the number of Florida schools recognized nationally for their efforts to create a healthy environment for their students has grown from 24 to 374. 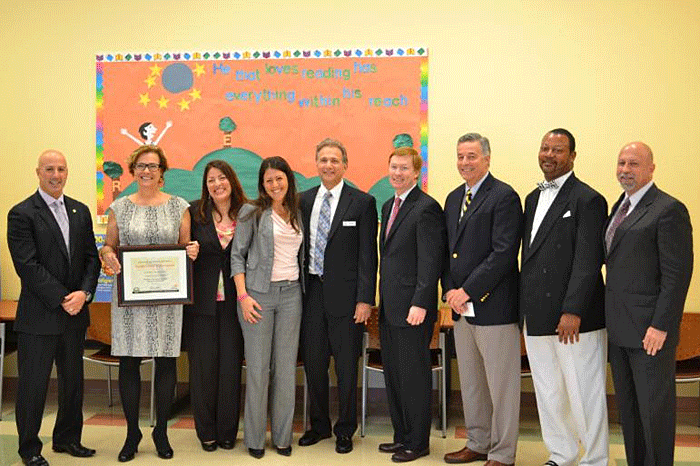 Allamanda Elementary School in Palm Beach County is one of the many schools in Florida to recently earn this national recognition. LAST SCHOOL YEAR, more than 440 million meals were served to the more than 2.8 million Florida children enrolled in the National School Lunch Program, but serving the meal is only half the battle. As Florida’s Commissioner of Agriculture, improving the nutritional value of school meals by adding more locally grown products to school trays (and convincing kids to eat it) is one of my top priorities. In 2011, I worked with the Florida Legislature to move the School Nutrition Program from the Florida Department of Education to the Florida Department of Agriculture and Consumer Services. I believed that we could direct more locally grown products to Florida’s school cafeterias and encourage healthy eating habits by aligning our school menus with Florida’s harvest seasons and establishing relationships between schools and farms. While we have made great progress in directing more locally grown, fresh produce to Florida’s school cafeterias, we discovered the most difficult challenge is getting the healthy menu items the last 18 inches, the distance from the tray to the mouth. To eliminate that 18-inch gap, we turned to a tool familiar to students: a mobile app. We partnered with Nutrislice to develop an app for tablets and smartphones that features detailed school breakfast and lunch menus. The Nutrislice app is more than just a digital version of the school lunch menu — it is an interactive tool that provides nutritional information, opportunities to rate menu items, and even allergy alerts. We’re also using social media technology in the cafeteria to encourage students to make healthy choices. We partner with schools to host lunch-time competitions to boost consumption of healthy foods. Students are divided into teams and challenged to try the produce item of the day. Staff or volunteers can track the points using an app on a smartphone, and the scores are streamed live on a display in the cafeteria. The real-time scores drive more and more students to put their team ahead by trying the healthy item. Using Nutrislice, schoolchildren can also vote for their favorite foods and compete in educational activities about healthier eating. The Florida Department of Agriculture and Consumer Services partnered with Nutrislice to develop this interactive menu and provide it to Florida school districts free of charge. A new function allows kids and parents to plan the entire meal and see the nutritional summary of each item on the menu. Sixty-five of the state’s 67 school districts are using the app, and schoolchildren, parents, and teachers across Florida accessed the Nutrislice app more than 20 million times in its first year. Meeting children’s dietary needs is a key component in helping them achieve academic success, and research shows that healthy meals at school can have a lasting impact on Florida’s next generation. Children who eat well at breakfast and lunch have better attendance records, better performance reports, and higher test scores. I encourage students and parents to download the Nutrislice app and see how we’re trying get our kids to eat healthy, wholesome food from right here in Florida.